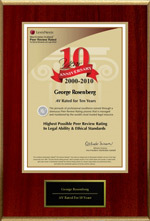 For over 40 years, George M. Rosenberg, Attorney at Law, has represented clients in Los Angeles and throughout California in all types of civil litigation, including personal injury, wrongful death, and general negligence claims involving car accidents, truck accidents, motorcycle accidents, bicycle accidents, premises liability, products liability, legal and medical malpractice, and roadway design matters. In addition, the firm handles business litigation, insurance bad faith actions, employment discrimination and wrongful termination, and construction defects cases. For additional information about the services we provide, please visit the practice areas overview. In his more than four decades of experience, George M. Rosenberg has handled jury trials in many areas of law, as well as bench trials, appeals, and arbitrations. Unlike some personal injury lawyers who settle each claim as quickly as possible, Mr. Rosenberg prepares each case as if it were going to trial, a strategy that helps to maximize settlement offers. Mr. Rosenberg has also appeared in the appellate courts, which has resulted in several published appellate cases. As further testament to his standing in the legal community, Mr. Rosenberg has received an AV Preeminent rating from Martindale-Hubbell, indicating that peers rank him at the highest standard of professional excellence. For details about his past successes, see our verdicts and settlements. By handling a select number of cases, Mr. Rosenberg is able to provide each client he takes on with personal attention, explaining the law and the options that are available at each step in the process. This approach has helped him earn the respect and appreciation of a wide range of clients and lawyers; for information about their experiences, please visit the testimonials page. To schedule a consultation to discuss your case, contact George M. Rosenberg, Attorney at Law today.